We’d love your help. Let us know what’s wrong with this preview of Sing Them Home by Stephanie Kallos. With her best-selling debut novel, Broken for You, Stephanie Kallos earned comparisons to John Irving, Anne Tyler, Margaret Atwood, and Carol Shields, establi The eagerly anticipated second novel from the author of Broken for You - a national best seller and selection of the Today Show Book Club - is a sweeping, gorgeously crafted family story set in the American heartland. With her best-selling debut novel, Broken for You, Stephanie Kallos earned comparisons to John Irving, Anne Tyler, Margaret Atwood, and Carol Shields, establishing her as a writer of uncommon “wisdom and soulfulness” (Sue Monk Kidd). Sing Them Home is a deeply moving portrait of three grown siblings who have lived in the shadow of unresolved grief since their mother’s mysterious disappearance when they were children. Everyone in Emlyn Springs, Nebraska, knows the story of Hope Jones, the physician’s wife whose big dreams for their tiny town were lost along with her in the tornado of 1978. For Hope’s three young children, the stability of life with their distant, preoccupied father, and with Viney, their mother’s spitfire best friend, is no match for their mother’s absence. Larken, the eldest, is an art history professor who seeks in food an answer to a less tangible hunger; Gaelan, the only son, is a telegenic weatherman who devotes his life to predicting the unpredictable and whose profession, and all too much more, depend on his sculpted frame and ready smile; and Bonnie, the baby of the family is a self-proclaimed archivist who combs the roadsides for clues to her mother’s legacy, and permission to move on. To ask other readers questions about Sing Them Home, please sign up. I just don't know what to say about this one. At the core, this book is a family drama, in which 3 vaguely dysfunctional adult siblings try to make their way in the world after the bizarre deaths of both of their parents (Mom: sucked up in a tornado; Dad: struck by lightning). I loved this book when it focused on these characters. But the author was trying to do more than just tell the story of these people. She was trying to tell the story of an odd little Welsh town in Nebraska (what does it me I just don't know what to say about this one. At the core, this book is a family drama, in which 3 vaguely dysfunctional adult siblings try to make their way in the world after the bizarre deaths of both of their parents (Mom: sucked up in a tornado; Dad: struck by lightning). I loved this book when it focused on these characters. This book rocked my world. The writing is superb and I couldn't put it down. I usually stick to shorter novels, but had no trouble staying interested in this work. I might have to buy my own copy so I can underline the innumerable insightful passages in the book. Okay, maybe I am too picky, but editorial errors make me crazy and can even stop me from reading any further! In like the second chapter, a minor character, Kris, is introduced. Just a few paragraphs later, and from then on, the same character is referred to as "Chris". Why why why would no one have caught this? I am only reading on because of all the other great reviews that promise a terrific story... Grrr! ... So I finished the book, but the editorial errors continued. For example, the stage i Okay, maybe I am too picky, but editorial errors make me crazy and can even stop me from reading any further! In like the second chapter, a minor character, Kris, is introduced. Just a few paragraphs later, and from then on, the same character is referred to as "Chris". Why why why would no one have caught this? I am only reading on because of all the other great reviews that promise a terrific story... Grrr! It's been a long time since I've felt so close to what I begrudgingly must admit are fictional characters. And I don't mean that these characters felt like friends or neighbors, but that each of them was a part of me, and their story on the page was a piece of my story I hadn't yet considered. Kallos' writing is stunning -- poetically lush and sharp at the same time. Beware, there is magic realism here; the dead will speak, but it only makes the voices of the living more distinct. This story has It's been a long time since I've felt so close to what I begrudgingly must admit are fictional characters. And I don't mean that these characters felt like friends or neighbors, but that each of them was a part of me, and their story on the page was a piece of my story I hadn't yet considered. Kallos' writing is stunning -- poetically lush and sharp at the same time. Beware, there is magic realism here; the dead will speak, but it only makes the voices of the living more distinct. This story has so much to tell you, and your listening will be rewarded. Sing Them Home is a moving portrait of three siblings who have lived in the shadow of unresolved grief since their mother’s disappearance when they were children. Everyone in Emlyn Springs knows the story of Hope Jones, the physician’s wife whose big dreams for their tiny town were lost along with her in the tornado of 1978. For Hope’s three young children, the stability of life with their preoccupied father, and with Viney, their mother’s spitfire best friend, is no match for Hope’s absence. La Sing Them Home is a moving portrait of three siblings who have lived in the shadow of unresolved grief since their mother’s disappearance when they were children. Everyone in Emlyn Springs knows the story of Hope Jones, the physician’s wife whose big dreams for their tiny town were lost along with her in the tornado of 1978. For Hope’s three young children, the stability of life with their preoccupied father, and with Viney, their mother’s spitfire best friend, is no match for Hope’s absence. Larken, the eldest, is now an art history professor who seeks in food an answer to a less tangible hunger; Gaelan, the son, is a telegenic weatherman who devotes his life to predicting the unpredictable; and the youngest, Bonnie, is a self-proclaimed archivist who combs roadsides for clues to her mother’s legacy, and permission to move on. When they’re summoned home after their father’s death, each sibling is forced to revisit the childhood tragedy that has defined their lives. With breathtaking lyricism, wisdom, and humor, Kallos explores the consequences of protecting those we love. Sing Them Home is a magnificent tapestry of lives connected and undone by tragedy, lives poised—unbeknownst to the characters—for redemption. **Rate this one 2/5. While I loved the author's first novel, I was disappointed in her second book. The book was way too long in telling the story and I couldn't establish any bond with any of the characters like I did in her first book. If I fell in love with Stephanie Kallos's first novel, Broken for You, and then again with her third, Language Arts, imagine my delight when I discovered her sophomore novel, Sing Them Home, and went head over heels a third time. There are very few authors, and only Barbara Kinsolver comes to mind, whose work is so consistently amazing that it is, indeed, like falling in love to read their work. Fresh writing, still fresh. Deeply imagined places, characters and themes. Sing Them Home is one of t If I fell in love with Stephanie Kallos's first novel, Broken for You, and then again with her third, Language Arts, imagine my delight when I discovered her sophomore novel, Sing Them Home, and went head over heels a third time. There are very few authors, and only Barbara Kinsolver comes to mind, whose work is so consistently amazing that it is, indeed, like falling in love to read their work. Fresh writing, still fresh. Deeply imagined places, characters and themes. Sing Them Home is one of those rare books that I find myself slowing down to read, savoring every word. Sometimes laugh-out-loud funny, Sing Them Home is also downright capable of bringing tears to this old cynic's eyes. I anxiously awaited the release of this book as I loved the author's first book: Broken for You. This book was scheduled for a January 2009 release but hit the stores and libraries earlier. Sing Them Home is a moving portrait of three siblings who have lived in the shadow of unresolved grief since their mother’s disappearance when they were children. Everyone in Emlyn Springs knows the story of Hope Jones, the physician’s wife whose big dreams for their tiny town were lost along wit I anxiously awaited the release of this book as I loved the author's first book: Broken for You. This book was scheduled for a January 2009 release but hit the stores and libraries earlier. Sing Them Home is a moving portrait of three siblings who have lived in the shadow of unresolved grief since their mother’s disappearance when they were children. Everyone in Emlyn Springs knows the story of Hope Jones, the physician’s wife whose big dreams for their tiny town were lost along with her in the tornado of 1978. For Hope’s three young children, the stability of life with their preoccupied father, and with Viney, their mother’s spitfire best friend, is no match for Hope’s absence. Larken, the eldest, is now an art history professor who seeks in food an answer to a less tangible hunger; Gaelan, the son, is a telegenic weatherman who devotes his life to predicting the unpredictable; and the youngest, Bonnie, is a self-proclaimed archivist who combs roadsides for clues to her mother’s legacy, and permission to move on. When they’re summoned home after their father’s death, each sibling is forced to revisit the childhood tragedy that has defined their lives. I usually love books about family sagas, family secrets and, stories with quirky dysfunctional characters. This book certainly contained those elements, but I found this book to be a HUGE disappointment. The only part I really enjoyed was reading the entries in Hope's journal right up to the time of her disappearance. The other criticism I has was that at 500++ pages the ending seemed to be rushed. In summary, I found the book easy to put down and harder to pick up afterward. I am glad I borrowed it from the library. The book was just okay. The editing seemed to be non existent. There were spelling errors, names were spelled differently from one page to another and some parts just went on for way too long. Any good editor would have chopped a few paragraphs, took out a few adjectives, made sure the names were consistent throughout and corrected the spelling. These errors made the book much less enjoyable. When I began this book, I just knew it was going to be a great read. However, the more I read the less interested I became. It seemed to drag on and on and on.....I kept looking for "the point". And the ending, well, it just really left me hanging. This may be my new favorite novel: I love the rendering of Nebraska (where I currently reside) and its exploration of grief and absence. The characters are complicated and nicely drawn. A lovely book, seriously. Amazingly layered, so many complete characters. One of those books that you must immerse yourself in, and then feel panic when you realized the end is near. This is a saga, a sweeping family story that lodges in your marrow, the kind of story that makes you smile, laugh, weep, snort, chortle, sing, spread your arms wide and lay your heart wide open. With flavors tender, ribald, ironical, farcical, tragic, magical, and wondrous, Sing Them Home narrates an epic story of a family emotionally disrupted by the disappearance of their mother (and wife), Hope, in a Nebraska tornado of 1978. Hope was swept up, along with her Singer sewing machine and a Steinw This is a saga, a sweeping family story that lodges in your marrow, the kind of story that makes you smile, laugh, weep, snort, chortle, sing, spread your arms wide and lay your heart wide open. With flavors tender, ribald, ironical, farcical, tragic, magical, and wondrous, Sing Them Home narrates an epic story of a family emotionally disrupted by the disappearance of their mother (and wife), Hope, in a Nebraska tornado of 1978. Hope was swept up, along with her Singer sewing machine and a Steinway piano, but she never came down. Due to the absence of her remains, all that stands in the graveyard is her cenotaph. Twenty-five years later, the three grown-up children are still trying to cope with their grief. None ever married. Larkin, an art history professor (whose work is symbolic with her loss and grief) hides behind food and refuses to "leave the ground." Gaelan is a weatherman (ah! the irony) who has only superficial, sexual relationships with women, and the youngest, Bonnie, is a virgin and garbologist. She roams after storms to look for "archival" remains of things that flew away in the tornado with their mother. And she talks to the dead at the cemetery. There is also a beloved but inscrutable stepmother, Viney, (although she never legally married their dad); a large supporting cast of unforgettable characters; ancestral Welsh traditions; and the Nebraska weather and topography, a salient ingredient in pulling the story together. The prose is beautiful and evocative as the story moves along non-linearly, but with grace. Past events are revealed gradually and build momentum as it catches up to the present. You will experience an intimate relationship with these radiant, unconventional characters and their extraordinary story. There are some themes similar to The Lovely Bones--loss, unresolved grief, isolation, the meaning of memories and the idea of home. However, Kallos' novel is richer, more sprawling and textured. John Irving comes to mind, with veins of Philip Roth, Margot Livesy, and Ann Tyler. She is an original, though--she leaves her own memorable imprint. This is no garden-variety redemption story. It exhilarates with an elixir of spiritual, metaphysical and deeply human voices, of things said, unsaid, unuttered, and forever sung. This book was absolutely beautiful. I loved every single page of it. The characters were so vivid, the prose so gorgeous, the setting so lovingly described...it is a true classic. When Hope Jones goes up in a tornado in 1978, it gives her children no way to let go of her. Without a body, they, and the town, cannot perform the traditional days of grieving and singing that they have inherited as part of their Welsh lineage. While those rituals help with loss for everyone else, without a body for Ho This book was absolutely beautiful. I loved every single page of it. The characters were so vivid, the prose so gorgeous, the setting so lovingly described...it is a true classic. When Hope Jones goes up in a tornado in 1978, it gives her children no way to let go of her. Without a body, they, and the town, cannot perform the traditional days of grieving and singing that they have inherited as part of their Welsh lineage. While those rituals help with loss for everyone else, without a body for Hope, they cannot take place...and the three Jones children remain unsettled and unable to move forward with the love they need in their lives. This book was about so much. First of all, it was about love: the love that a mother holds for her children, the love of a community for the land and people that make it up, the love of family for each other, the love of husband and wife. It was about all the ways that people express that love, and about how much it matters. 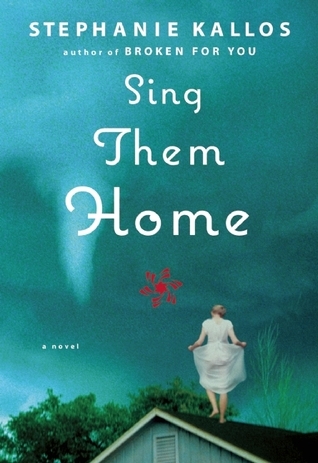 "Sing Them Home" is also set in Nebraska, in Tornado Alley. It is written by a Pacific Northwesterner, with the Seattleite's fascination with the small towns of the prairie. And I also wondered, are their towns like Emlyn Springs, towns that have held onto their original European heritage for hundreds of years, to the point where they speak their ancestral language and follow the traditions and consider it part of their very being? Is that how history is preserved, not with the history books, but by the keeping of the everyday, even when its transplanted and modified slightly? I loved this book! It is a beautifully written story of one family and one Welsh Town in Southeastern Nebraska. We are taken through the life of Hope and Llwellyn Jones and their three children, Larken, Gaelan and Bonnie. This is also the story of Vinie (the children's stepmother) yet she never really married their father. The couple marry in the early 1960's and settle down in his hometown of Emlyn Springs, Nebraska. It is a town that honors all their Welsh traditions and Hope falls in love with I loved this book! It is a beautifully written story of one family and one Welsh Town in Southeastern Nebraska. We are taken through the life of Hope and Llwellyn Jones and their three children, Larken, Gaelan and Bonnie. This is also the story of Vinie (the children's stepmother) yet she never really married their father. The couple marry in the early 1960's and settle down in his hometown of Emlyn Springs, Nebraska. It is a town that honors all their Welsh traditions and Hope falls in love with the town as a young woman. Llwellyn is a Doctor and Hope a stay at home mom, who suffers several miscarriages before giving birth to 3 children. Through excerpts from Hope's diary throughout the book we learn of her feelings as she goes through these losses and tries to adapt to and fit in to this very "set in its ways" small town. At the same time we are taken through present day (2004) and the lives of Larken, Gaelan, Bonnie and Vinie. Llwellyn is struck down and killed by lightning in 2004 and from that point on we learn the details of the life he has had. We learn that Hope was diagnosed with MS and that she was "taken up" during a tornado in 1978. Okay, between 4 1/2 and five stars. A really good book! It starts near the "end" of the story, with a father's death due to being hit by lightning on the golf course. His three adult children -- all of whom are quirky and unusual, perhaps due to the mysterious disappearance of their mother during a tornado when they were children -- come home to mourn him and to reconnect with their past. The setting is the small town of Emlyn Springs, Nebraska, a town founed by Welsh settlers, which has held fi Okay, between 4 1/2 and five stars. A really good book! It starts near the "end" of the story, with a father's death due to being hit by lightning on the golf course. His three adult children -- all of whom are quirky and unusual, perhaps due to the mysterious disappearance of their mother during a tornado when they were children -- come home to mourn him and to reconnect with their past. The setting is the small town of Emlyn Springs, Nebraska, a town founed by Welsh settlers, which has held firmly to its Welsh heritage. Much of the story is told either in flashbacks or with excerpts from their mother's diary. Some reviewers have called this a novel of magical realism; if it is, it's more realistic than magical, though there are mysteries. Lots of metaphors: singing, light/vision/blindness, mystery, weather. It's a wonderful story which brought me to tears or to out-loud laughter more than once. Wow! I don't even know where to start. This is a very special novel; I haven't read anything this good in a long time. Our story begins with the death of Llewellyn Jones, the mayor of Emlyn Springs, Nebraska. His death brings together the three Jones children: Larken, Gaelan, and Bonnie. Larken is now a respected professor of art history at the University of Nebraska, Gaelan is the hunky weatherman for KLAN-KHAM, and Bonnie is the town eccentric of Emlyn Springs. Each sibling has his/her own comp Wow! I don't even know where to start. This is a very special novel; I haven't read anything this good in a long time. Each sibling has his/her own complex and intriguing story, as well as a part in the family's tragic past. You see, their mother, Hope, was blown away in the tornado of 1978, never to be seen again. Everyone assumes that she is dead, but no evidence exists to prove it. As the siblings come together, their lives start to unravel. It is as though tragedy follows them. As you read, you will feel their pain and wish that you could help them. This is an excellent novel. The character development is amazing, the setting is incredible, and the plot contains pleasant surprises. I highly recommend Sing Them Home. Read the first chapter, but couldn't make myself go any farther. Some reviews said the book got better after the first 100+ pages, but I couldn't make myself trudge through to the "better" part of the book. Just goes to show you that the beginning of the book is just as important as the rest--often you can lose your reader in the first 25 pages, especially if the book doesn't "get good" until after the first 100 pages. I gave up on this book after about 160 pages. At a recent staff meeting with Nancy Pearl as guest speaker we learned there are 4 basic kinds of books, books with story as the prime gateway, or those with character, setting or language as the gateway. This was a character book and I just couldn't like these folks enough to continue on. A big disappointment to me since I like her previous book, Broken For You so much. Some good stuff here, but unfortunately it was a good 300 pages too long. I do not mind long books, but Kallos definitely did some unnecessary rambling. In the first half of the book, the characters reminded me exactly of rubble from a tornado--they were disconnected, displaced, remote, without a home. It was nice to see them come together, and some of the characters were charming. Stephanie Kallos has a remarkable gift. She writes about everyday life and the kind of people that you might not notice as you pass them on the street, and make them both come alive in a magical way. A small town, parents and children, brothers and sisters, and a longing for family mixed with the fragility of happiness all come together to make this a wonderful book. I wish Kallos had taken the time to craft the type of novel she did with Broken For You. This isn't it. It was okay, barely, okay. There were at least six different narrative voices, and that was probably five too many. Had she focused the story on just the mother, it might have been better. Also, she had some bad data on fat girls. That never plays well for me, only annoys. This book was way too long for the story it was telling. Initially the extensive description was great, then it just became too descriptive. The premise of the book sounded interesting: 3 young siblings left behind after their mother disappeared during a tornado; all supposedly with stress related mental issues. The oldest, Larken Jones is an overweight art professor hiding her eating disorder from everyone. Perpetually single but in love with her married neighbor. She's just existing from day to day not really living at all. The middle child, Gaelan is an overly sensitive and good looking body-building weatherman who uses women and The premise of the book sounded interesting: 3 young siblings left behind after their mother disappeared during a tornado; all supposedly with stress related mental issues. The oldest, Larken Jones is an overweight art professor hiding her eating disorder from everyone. Perpetually single but in love with her married neighbor. She's just existing from day to day not really living at all. The middle child, Gaelan is an overly sensitive and good looking body-building weatherman who uses women and discards them (or they discard him). I got the feeling he might be gay and hiding it from everyone including himself. (I was surprisingly wrong about this.) And of course, the youngest, Bonnie who is an anomaly. She collects trash in an effort to find a clue to her mother's disappearance. She basically lives in a shack with all this junk as decoration. She is very civic-minded: mowing old ladies lawns, going to the school to help with the kids, attending town meetings, etc. She's rather odd but perfectly content. The story is very disconcerting because it jumps back and forth in time. When any of the children are traveling, the story regresses (without notice) to an earlier time in their lives. Then jumps back to the place in time they actually are. The most disconcerting this is that Hope Jones (their mother) isn't part of the story at all. By the time the story starts, she has already "gone up" as they refer to her death. So you don't get a feel for her or of her personality. The only way you "know" Hope is through her diary entries and they don't show her in the best light. Unfortunately, I found Hope to be whiny and irritating as hell. I just couldn't find it in myself to like her at all and I became rather uninterested in reading (listening) to her constant diatribe. This is not usually something I would read but I needed a book set in Nebraska and this is all I could find that I was even willing to read. Thankfully I found an audiobook otherwise I never would have gotten past the first chapter. Though in a hard copy I could have easily skipped over all the stuff that happened once Llewlyn Jones died instead of having to endure all the Welsh singing and the morbidity of the weekly death extravaganza. Where one description would suffice, the author repeatedly used three. I found the entire story to be more babble than substance making a 300 page book into a 542 page monstrosity. One of the things I really liked about this book was that "the dead" as a group are characters in this book with lives, interests, and a tendency to gossip beyond the grave. Not like zombies or in the way that stories usually have dead characters in a book, where living characters have memories of them or readers are taken back in time to see them when they were alive. The dead in this book are dead, but have active "lives," spiritually hanging around the cemetery, traveling around the world, ke One of the things I really liked about this book was that "the dead" as a group are characters in this book with lives, interests, and a tendency to gossip beyond the grave. Not like zombies or in the way that stories usually have dead characters in a book, where living characters have memories of them or readers are taken back in time to see them when they were alive. The dead in this book are dead, but have active "lives," spiritually hanging around the cemetery, traveling around the world, keeping an eye on the living in their small Nebraska town, commenting on the smart or stupid behaviors of the living, and generally functioning a bit like an off-stage Greek chorus. As Kallos notes on the first page, "It's so hard to explain what the dead really want." And in addition to watching the development of and interactions between the three main sibling characters, their dead mother, and their widowed stepmother, I greatly enjoyed learning more about Welsh culture, as that is a small percentage of my own ethnicity about which I know virtually nothing. The importance of music and singing, the rites and rituals around death and grieving, the food and "fancy eggs," the strictures and supports of faith, the expectations and loyalty of family: these pieces of Welsh life maintained by Americanized descendants in small-town, rural Nebraska are made palpable through Kallos's depiction of Emlyn Springs and its residents. I really don't know about this book. I guess I liked it because of the characters that are unusual and well defined. But, I like a riveting plot and there was no overall plot. There were the subplots that involved each of the 4 main characters, but there really was not a larger "scheme of things". I also felt like after all the sadness and dysfunction in the lives of the characters, Kallos felt like she had to bring us into the sunlight so she provided a quickly and neatly wrapped happy ending. I really don't know about this book. I guess I liked it because of the characters that are unusual and well defined. But, I like a riveting plot and there was no overall plot. There were the subplots that involved each of the 4 main characters, but there really was not a larger "scheme of things". I also felt like after all the sadness and dysfunction in the lives of the characters, Kallos felt like she had to bring us into the sunlight so she provided a quickly and neatly wrapped happy ending. She takes 500 pages to tell the story then wraps it up in less than 100. Parts of this novel had dead people conversing with each other, so it seemed like fantasy. Other parts were in diary form, so it seemed like a fictional memoir. Then there were sections of realistic fiction. But I never got a handle on the point nor the genre. I probably should have given it two stars, but the characters were people that you could carry with you, if not in your heart, than at the least in your brain. Three siblings with very dysfunctional lives. The bizarre traits of each were caused in large part by the disappearance of their mother when they were young. She was carried away by a tornado. Their father was later killed by a bolt of lightening. These characters are richly developed and highly creative. From the mother's diary, "Erasure that's what I long for. If I leave nothing of myself behind, mightn't I lessen their grief? I don't want them remembering me with the assist of scrapbooks or photo albums. I want them to carry me with them in the air that they breathe." I really can't believe I finished this book. I took the bookmark out of it several times. But, I did want to see what happened to each character. The 2011 All Iowa Reads book is Stephanie Kallos‘ Sing Them Home. I just listened to this book on disc and thoroughly enjoyed it. I look forward to discussing this book with others as a part of the All Iowa Reads program in 2011!! Sing Them Home is set in the small Welsh community of Emlyn Springs, Nebraska and focuses on the Jones family. Everyone in Emlyn Springs knows the Jones family because their matriarch, Hope Jones, was carried away by a tornado and was never seen again. Hope’s family, in The 2011 All Iowa Reads book is Stephanie Kallos‘ Sing Them Home. I just listened to this book on disc and thoroughly enjoyed it. I look forward to discussing this book with others as a part of the All Iowa Reads program in 2011!! Sing Them Home is set in the small Welsh community of Emlyn Springs, Nebraska and focuses on the Jones family. Everyone in Emlyn Springs knows the Jones family because their matriarch, Hope Jones, was carried away by a tornado and was never seen again. Hope’s family, including her husband, three children, and best friend, are unable to move on because of the questions surrounding Hope’s disappearance. Hope’s children, Larken, Gaelan, and Bonnie, struggle with identity issues and long for answers about their mother. Excerpts from Hope’s diary are woven into the story to give Hope’s perspective of life in Emlyn Springs as well as insights into her thoughts and character.